The many possible carvedilol side effects include nausea, dizziness, headache, cough, joint pain, insomnia, blurred vision, and general fatigue. The drug can also trigger a hypoglycemic reaction, the symptoms of which include extreme hunger and thirst, weakness, and frequent urination. 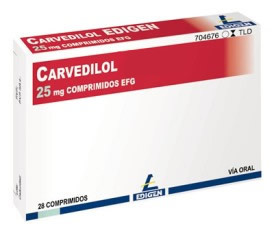 Some of the most serious carvedilol include chest pain, shortness of breath, irregular heartbeat, and fainting. Some patients have also complained of nightmares and sleep disturbance, though doctors believe that this results from failing to follow the instructions for self-administration. Anyone experiencing these symptoms, or a persistence of more common side effects, should seek immediate medical attention. Most men and women experience similar side effects of carvedilol. However, there are a few side effects that appear to be gender specific. For example, urinary incontinence and interstitial pneumonitis (lung disease or lung scarring) are both recorded more frequently in women taking the drug, though these side effects occur only rarely. Men, on the other hand, are more likely than women to report a decrease in libido after beginning treatment with carvedilol. There is little to no conclusive evidence regarding the side effects of carvedilol in pregnant women. However, some research has been done to test the drug on other mammals (namely rabbits and rats), and results indicated a decrease in fetal body weight and bone mass. While this does not prove that humans will exhibit the same side effects, women who are pregnant or may be pregnant are generally advised not to take the drug unless absolutely necessary. The side effects of carvedilol in children under the age of 18 are not entirely known. Those few children who have been administered the drug exhibited complained of chest pain, shortness of breath, and dizziness (though this occurred in only 11-13% of pediatric patients). It has not been established whether carvedilol is even an effective treatment for heart failure in children, so it is not commonly prescribed. Nursing mothers, on the other hand, are advised to avoid the drug or to stop nursing while taking carvedilol, as its transference through breast milk may cause neonatal distress. Weight gain is a commonly reported side effect of carvedilol, though its occurrence is widely varied and physicians are unsure whether the drug itself can be solely to blame for weight fluctuations. Studies do show, however, that those patients taking carvedilol as a treatment for congestive heart failure are more likely to gain weight than those taking the drug for high blood pressure; in fact, weight gain is almost never reported by those in the latter category. Rapid weight gain, however, is a sign that congestive heart failure may have worsened, and should be addressed immediately. In spite of these side effects, carvedilol has been approved safe for use in patients with high blood pressure or congestive heart failure. However, it is important for patients to carefully follow the instructions for taking the drug, and to avoid abruptly discontinuing use, as this may result in heart attack or arrhythmia.